An evacuation sledge aids in the evacuation of a building in the event of an emergency, providing a means of escape for those unable to descend the stairs on their own. The Bariatric Evacuation Sledge is a wide sledge that offers a solution for the evacuation of larger individuals in an emergency situation. With foam padding and reinforcement, as well as sturdy handles and safety belts, this sledge enables you to transport bariatric users in a manner that is both safe and comfortable. According to the Regulatory Reform (Fire Safety) Order 2005, buildings need to have an escape route available for everyone, including individuals who are disabled, injured, pregnant or unable to use the stairs for another reason. An evacuation sledge provides a means to evacuate individuals with mobility issues, and the wider Bariatric Evacuation Sledge enables larger users to be assisted in comfort with no concerns over safety. The Bariatric Evacuation Sledge is wider than a standard-sized evacuation sledge and is reinforced across the base with webbing, which provides a slippery surface to improve strength and mobility. In addition to webbing, this sledge features two foam layers – an upper layer to enhance the comfort of the user, and a lower, heavy-duty layer that protects the patient while in transit. As a result of reinforcement, this sledge can hold up to two tonnes in weight, making it suitable for a vast range of patients. This sledge is fitted with safety belts and a foot pocket for maximum safety. It also has long handles to enable one to two people to operate it safely with ease and comfort. 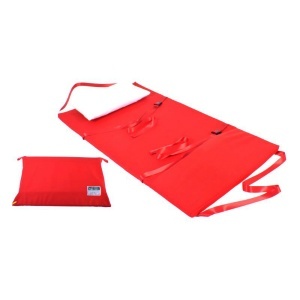 This bariatric evacuation sledge is supplied with a heavy duty bag for easy storage. It can be hung on the wall when not in use, allowing it to be positioned in ideal places such as by the stairs. The base of this sledge can be run over tiles, carpet and other floor types – without causing discomfort – making it suitable for a wide range of environments. In addition, this fire evacuation sledge is suitable for use on most staircases, including spiralling staircases. Please note that the Bariatric Evacuation Sledge is made to order and therefore has an estimated delivery time of five days. Please contact our customer service team on 020 7501 0593 if you require more information about the delivery of this item.